Training for an Ironman is a funny thing. The distances and times involved in the event are so long that, on one level, I sort of forgot that a half-ironman is the longest athletic event I’ve ever done. In the days leading up to Sunday’s Challenge Quassy half-ironman, I was feeling pretty relaxed about the distances but kept reminding myself not to underestimate the event. For one thing, everyone I ever talked to about Quassy took a particular amount of glee informing me that it was a hilly course. I live in the hills—and I’d been riding them this year since there was still snow on the ground—so I wasn’t terribly worried. But still . . .
And then there were my wicked high blood sugar readings during my last few triathlons. This is stuff I can’t practice during my regular workouts, because the highs are from race-day stress, and I just don’t get that worked up on a daily or weekly basis. This triathlon was a chance to make some changes involving extra insulin, which is scary stuff. So I was a little nervous. What would happen? Would the hills kill me? Would my BGs behave? Would extra insulin put me in the BG penalty box? How is my nutrition and hydration plan working? Is my fitness where it should be just under halfway through my Ironman training? Swim: The Flat Part of the Race. Once upon a time, I wasn’t very good at swimming. At least, that’s what I told myself. I mean, it was kinda true. Compared to my peers, I was near the back. Nowadays, I’m gradually coming to terms with the fact that I can keep up pretty well—actually, that I’m far enough ahead of the flailing mob that the swim doesn’t seem so bad. On Friday I went to a diabetes technology conference. Cliff Scherb, who at one point held the record for the quickest Ironman by anyone with diabetes at 9:07, was also there. We talked triathlon a bit, and he told me how he balances insulin, food, and tri. It involved a lot of insulin going into the event and was frankly a bit scary. In a recent comment here, Peej told me what she did. Not surprisingly, it included more insulin than I had been taking. I decided to be a little conservative and change what I had been doing in a small way. BOOM! I bolused slightly less insulin than the sandwich required, was woken an hour later by my CGM’s “Predicted High” alarm, delivered a bit more insulin, and tried to sleep for a couple more hours. (It didn’t really work.) I felt fine—more or less—knowing that having a bit of insulin on board would probably be okay. Probably. Fast-forward a few hours. While setting up my spot in transition, I saw one of my fellow triathletes, who was doing the bike leg on a relay team. But that was later, right now he was wearing a crown and heavy red cape and talking with the race director. He was pretty fly. I dubbed him “El Rey de Tri,” the king of triathlon. He would become a recurring figure throughout the rest of the day. When I left my CGM in transition, I was hovering around 160 mg/dL (8.9 mmol/L) and feeling alternately good and nervous. About 15 minutes before my start, I ate a Clif Bar, took 1.5 units of insulin, and got ready for the swim. The water was the perfect temperature and it was so clean and clear. I sighted well, held a nice straight line, and swam hard. A few times I felt people drafting off me, as they accidentally grabbed my feet. The 1.2 miles of the swim passed quickly in 35:36. 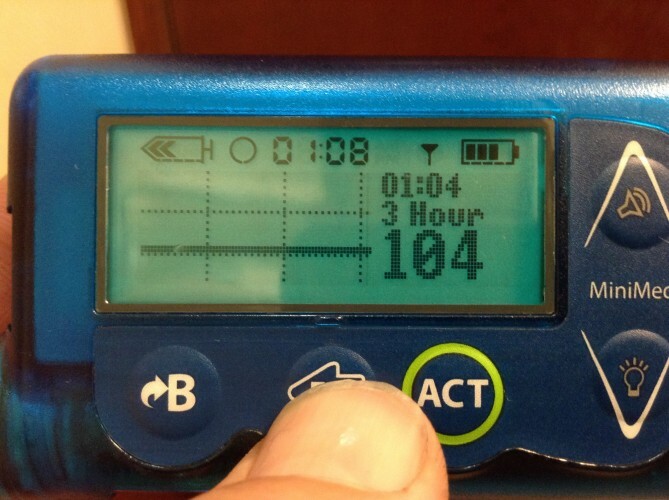 When I got back to transition, my continuous glucose monitor told me good news. Bike: I Like Big Hills and I Cannot Lie. Quassy wasn’t my first choice, but I missed my opportunity to sign up for the Patriot Half, so I did this other kind-of-local race I’d heard about. Hills? Ironman Wisconsin is supposed to be hilly. Why not do this race? Although it’s hilly where I live, you can find some flattish stretches if you try. Whoever made this course decided to find the hilliest 56 miles possible, it seems. Anyway, this course had it all: long, gradual uphills; short, steep uphills; long, steep uphills; and wicked-fast descents, often with sharp turns along the way. One of the climbs was 4.5 miles long and gained over 750 feet (roughly 3% grade). Another, shorter hill had me out of the saddle, struggling to stay upright. My speed was about 2.5 miles per hour slower than my usual 70.3 pace. I got passed by so many people on the bike. I guess this is the downside of having a stronger swim. Clearly it’s something to work on for the next few months. The bike was a bit painful, all 3 hours and 15 minutes of it. I finished just ahead of El Rey. Run: Satan Made This Course. And when I said “painful,” I meant it literally. When I headed out for the run, my left groin felt really tight, and there was a bit of a hitch in my gait. I’m sure it was from pushing up the hills on the bike. And, of course, the run course started on an uphill. I wasn’t sure how much of the run I was going to have to walk. It turned out, none of it. After about the first mile and a half—when I got to the first downhill—my muscles had loosened up. I played a bit of leap-frog with a guy whom I would pass on the downhills only to have him pass me on the ups. He was never more than 200 yards away from me until the final three miles when I threw down. I finished the run in 1:53:57, which is much better than I had expected. Right around the time I left my leap-frog companion behind, I saw Cliff Scherb. He’s a coach, and several of his triathletes were racing. He was running around to give his athletes encouragement, when he saw me. About 15 seconds after we saw each other, I felt a big strong arm around my shoulder, literally propelling me forward. We chatted for about a minute, with him giving me lots of encouragement. It really got me going for the last couple miles. The run course had 1,900 feet of elevation gain and barely had any flat sections. It made a sort of figure eight, and the crossover was a spot near the start/finish. Just before starting the second loop of the “8” I saw El Rey, who was standing on the course with a bullhorn, just being awesome and giving encouragement. “¡El Rey de Tri!” I called out, and he gave me a few motivating words. Six miles later, I was finishing the last, painful uphill when I saw him again. “It has finally come to pass. Competitor number 1-2-3-8 is heading into the finish.” I gave him some finger guns and made a left turn . . . straight into the finish. I saw Lisa a few times out on the course. She’s been wearing her bright orange “Team Jeff” T-shirt, which makes her nearly impossible to miss. I love that woman! It just makes me so happy to see her there. On the way home I looked over her pictures and we talked about our respective race experiences. You’ve read my take. Here’s Lisa’s view. Looks like we both had successful race day plans. Good for you my friend. Another half ironman notch in your belt. And great job by Lisa as always. I thought I commented on this, but I guess not? Anyways, CONGRATULATIONS!!! Like I said in the ROI FB group, I’m so happy you were able to set the BGs straight. And wow….5:51 on a deathly hilly course? You amaze me. And I hope I see “El Rey de Tri” somewhere, someday….